Congratulations on welcoming a new puppy into your family! As the owner (or soon-to-be owner) of a new puppy, you’ll start preparing for your new puppy by finding a veterinarian and purchasing all the necessities. But, after the fun part of choosing a cute collar and getting a name tag engraved, it’s time to get down to business by puppy proofing your home. Make sure your environment is as safe as possible by reviewing our new puppy checklist for bringing a puppy home. Keep your trash under wraps. Free of charge: cover and contain cords. Watch out for poisonous house plants. Heights: keep your pup grounded. Batteries are not remotely safe. Keep your trash under wraps. Trash cans are a mecca of interesting and exciting smells to a curious puppy’s nose, so it’s important to keep them covered and secured. Left to their own devices your new puppy could consume something toxic (like xylitol gum), swallow an object that causes internal obstruction (like tissues or a bone), or even get their head caught in a snack bag, putting them at risk of suffocation. Free of charge: cover and contain cords. Protect your new puppy from accidental shock, burns to the mouth, or worse, by using sturdy cord covers or deterrent sprays on electric cords, chargers, and power cables. Of course, a young pup should always be supervised when not contained in a crate or pen, but providing plenty of chew toys will also help to give your puppy a better outlet (pun intended) for their chewing energy. Properly stow your bags. It’s very likely that your purse, backpack, gym bag, or diaper bag contains one, if not many items that pose a threat to your new pup. Xylitol poisoning is becoming more and more common as it creeps into more products, like sugar-free gum, hand creams, etc. See a list of 700+ products containing xylitol here. Unintentional poisoning is one of the most common pet emergencies, so be sure to store bags in a closed closet or on a sturdy hook that is high and out of reach. Don’t let family members or visitors off the hook either. Create a drug-free zone. Human medications are the most common source of poisoning for pets every year, so be sure that all medications and supplements that might be sitting on nightstands or countertops are safely stored in secure cabinets or drawers. It is also wise to store pet medications separately from yours, and always dispense pills and liquids over a sink or bowl in case of spills. Watch out for poisonous houseplants. A houseplant may appear innocent, but it can cause serious problems, from mild irritation and digestive upset to organ failure and even death if your puppy decides to take a nibble. 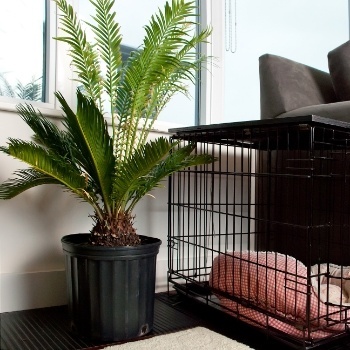 Some of the most dangerous plants for dogs include the Sago palm — pictured close to a puppy's crate in inset photo — (and other cycads), Castor Bean, American Yew, and the Autumn Crocus. This isn’t an exhaustive list, but you can see more on ASPCA Animal Poison Control’s list of poisonous plants and flowers. Give them space. Whether it’s a crate, a pen, or a fluffy spot on the sofa in the basement, your pup deserves a “safe space” to which they can retreat and be contained if you’re not home. Getting your pup used to a crate will have many benefits; for example, when you travel, take your dog to the groomer, or when they have to stay at the vet for a few hours. Pack your poisons. From household cleaners, detergents and glue, to yard and automotive chemicals, most homes are bound to have a few toxic substances that need to be locked up. Even a safety cap can’t stand up against those sharp puppy teeth. Antifreeze is especially enticing to pets, so take extra care when cleaning up spills and storing containers. Rat and mouse poisons as well as slug baits need to be kept out of reach. Set limits. Curious by nature, your puppy is bound to explore as much as possible and test their limits. Set up baby gates or pens and close appropriate doors to keep your puppy from getting into (or out of) places that you don’t want them to. Heights: keep your pup grounded. 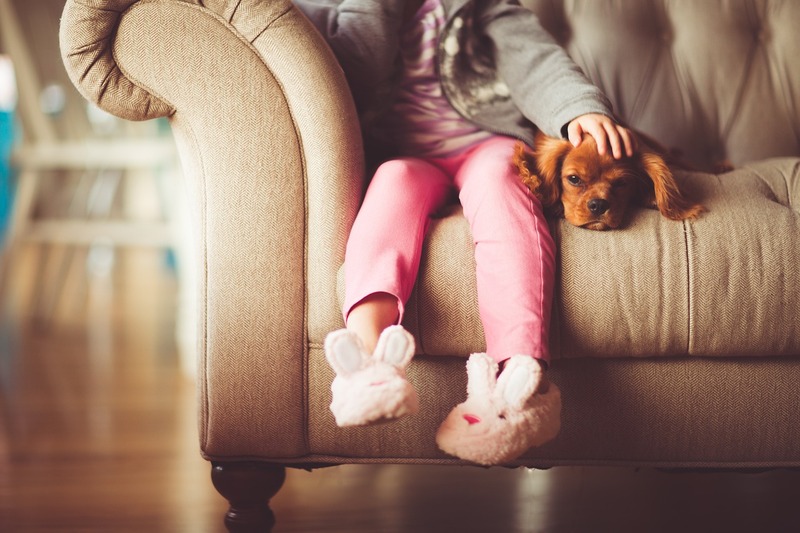 Puppies are clumsy and have fragile bones, so a seat on the couch or in a standing child’s arms puts them at risk of injury if they fall or try to jump. It’s best to keep your puppy off tall furniture and have young children sit when holding them, until your puppy is less fragile and more coordinated. Batteries are not remotely safe. Remote controls, electronic toys, key fobs, and any other devices that contain batteries should be picked up and kept well out of reach. Not only can small parts be chewed and swallowed, but a swallowed battery is even more dangerous because it can cause burns to the soft tissue inside your pet’s esophagus on the way down. Disc batteries are especially dangerous! Now that you’ve got your new puppy checklist, you can be confident that your pup will thrive in your loving, pet-friendly environment. If you've found this information helpful, check out our 101 Essential Dog Tips books. You can choose from 101 Essential Dog Health & Safety Tips or 101 Essential Dog Behavior & Training Tips or... don't choose, and just grab 'em both in a discounted bundle! Xylitol toxicity—this natural sweetener could be in your peanut butter!